Aries Games is about to get their lot. Not sure on price yet. Not seen it anywhere else in the UK yet and no sign of the beginners box. Yeh was a bit of a shocker as the USD retail is $59.99 but then current exchange rates have that as £46.45, the price seems about right in that respect. I had expected them to list the beginner box and they are the only stockest in the UK I know of. Importing it might also get expensive especially as from the USa it's the shipping cost, then customs charges, with from abother EU country being up inthe air if it is a delayed release. Oh good lord, I decided to hold fire for a couple of days so I could order the core box and beginners box at the same time as nobody was listing the latter yet.. and now the core box is sold out everywhere. Good job CGL! Probably be about 8 years to get a reprint. They don’t seem to want anyone’s money. I honestly don’t know how they are still in business. Stockholm syndrome, and Microsoft/Piranha basically keeping the IP relevant. Big problem is Iron Wind though, Catalyst has to jump through a lot of hoops to make these. How is Iron Wind still getting a license to make minis? Are they the only company that is asking for the license? No other company is interested? Or are they the best of the worst? Just still shocked they are still holding onto the license to make minis for BattleTech. Who wants 80s quality minis in the twenty first century? For those in the States. Miniature Market still has 6 copies of the Core in stock. The only IP in worse...more bizarre ownership is probably Robotech. Battletech is such an abused and neglected IP. Too late. Out of stock. Catalyst really doesn't want new customers to play. Yeah yeah, I hear them now, "we don't have much money so can't make a lot of product". Shame really. I hope this does help them. I guess getting a bigger order is no guarantee that they all would sell. So why not do what Games Workshop does. After all they seem to know what they are doing, so not a bad idea I guess. Would have been nice to be able to get a copy. You know, it's really weird. 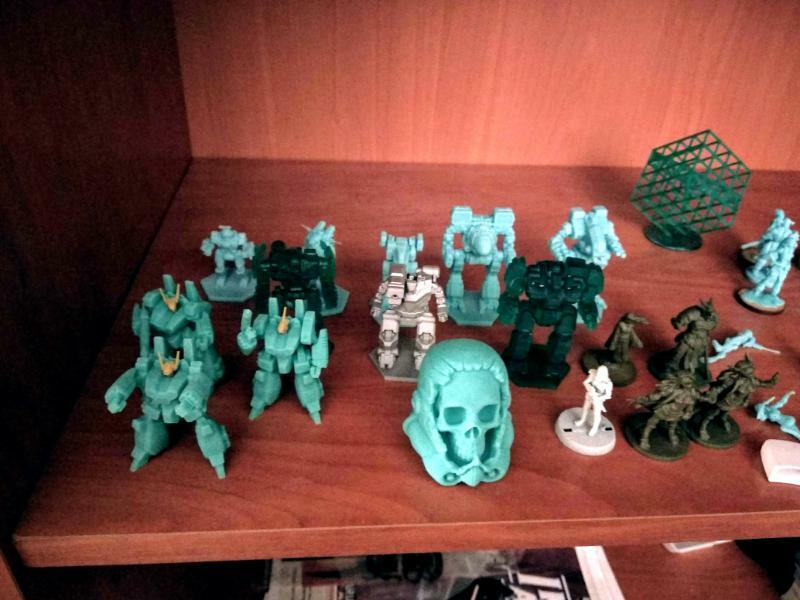 Ironwind has the benefit of every Battletech miniature being available, even some really obscure variants. They'll never move the volume of a typical wargame because of Battletech's low model count. For anyone else to take over it would either mean putting hundreds of designs out of production for years, or doing a full restart. Personally, I think Catalyst could do it, if they were willing to sever ties with IWM. Imagine a kickstarter for 3025, which puts 16 or so of the most popular designs in plastic. It's made, molded, shipped out in a year or two, then you do a kickstarter for 3050. You maintain momentum, and in 10 years you've got models available for 4 or 5 different eras, and a business model that's far more similar to Reaper Miniatures, who do the niche specialty model and enormous catalog really well. Except with Catalys it would take forever, and they'd be constantly out of stock after release. Iron Wind Metals (f.k.a. Ral Partha) has been making BattleTech miniatures since 1985 when the game was still called Battledroids. According to sarna.net there are 645 discrete BattleMech designs, with each design having anywhere up to a dozen variants which may or may not be visibly different from the base design. Starting over again from square one would be infeasible in my opinion. Maybe during the next event they'll just make slightly better BattleMechs to help phase out the old ones. They could call them... oh I dunno... Primaris BattleMechs? I started playing Battletech in 87. I loved the setting and the granular game play way back when. Their artist created captivating visuals for their universe. I stayed with the game through the WizKids era, getting even more involved as a play tester for the game. I hung on during the early Catalyst Years because I hoped they would get their feet back underneath them. Now, I couldn’t care less about the brand. I have seen shockingly unprofessional arguments between current and former employees on their discussions boards. The latest round of leadership has done even less than the last group, which is saying something. There is no direction. They waste their limited resources on books from across the vast timeframe of the game. The most recent book, which was desperately hoped to be the climax of a story arc that began in 89’ didn’t really wrap the story up, because the company said they wanted to really flesh out the end with a bunch of (never to be released) awesome books. I think the PDF for that book came out last summer maybe, I don’t really keep track, and it still not quite out in hard copy. The new boxes are overpriced and still not available. When the story ark of 40K moves faster than Battletech, which at its peak was a sweeping and constantly evolving space opera, you know there is a serious problem. Battletech is dead to me. Catalyst doesn’t deserve such a great IP. Quite possibly. FASA did purchase Ral Partha around 1998 a few years before they themselves ceased operations. The history of the BattleTech intellectual property and the various licenses can be quite confounding at times. Wait, what the hell. You're right. How are they sold out everywhere already? I am so glad I didn't actually fall down the hole of trying to get back into Battletech, it's fethed all the way down. I am so glad I didn't actually fall down the hole of trying to get back into Battletech, it's fethed all the way down. Why? The starter set isn't necessary to play in the slightest. Yeah, honestly speaking the paper boards is what irks me most. What on earth is going on with the availability of this stuff?! I'm paying attention to the forums and Facebook; understanding that delays happen, so when the flag finally goes up, I'm expecting a Google search to show me where I can get the boxes on this backwater island that I live on. This is like my parents trying to hunt down a Jawa figure for my Christmas present in 1980! I meant more of 'get back into CBT' fundamentally, with new models and a new box to work out of. I've got multiple old starters and probably a hundred bare metal mechs, but you need an entry product that people can actually purchase on shelves to build any community. The idea of a new starter with new models had me toying with breaking everything out and seeing if I could get anyone interested. Doesn't seem worth the effort. If you live in a backwater island, look at were I live... I was planing to get one box, and two beginner boxes from the US because there is no way anybody is going to carry this game to Japan, but it seems that I blinked and it's all gone I hope Catalyst arranges a second run but I¡m not going to hold my breath. It is if you actually want to play with good looking miniatures instead of something in the 20th century. There is a reason why most people don't play with Rogue Trader minis or second editon 40K minis. While good at the time, they do get nicer and better looking. You can't say that for Battletech minis until now. So not being able to buy the new box set, why bother getting into it then? I think another reason why BattleTech doesn't do goo is because the web sites are just atrocious for Ice Wind Metals. So even if people want to get into BattleTech, since Catalyst really does just the rules/story, people have to go to IWM for official minis and that web site is just atrocious. I basically gave up.